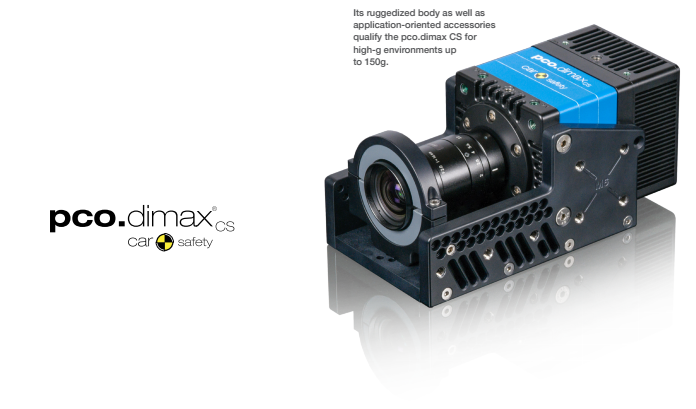 The pco.dimax CS has specifically been developed for car safety applications delivering 1500 frames per second at HD+ resolution with 1920×1440 pixels and outstanding image quality. PCO introduces a new high-speed camera combining all the essential qualities and features in one compact system without compromise. High-speed recordings are playing an increasingly import¬ant role in product optimization within the automotive industry. Cameras delivering slow motion pictures are one of several measuring systems used in a crash test facility that provide essential data for detailed analysis and have a huge impact on the workflow for technicians and test engineers. Crucial for demanding applications is the high-speed camera’s reliability; size and usability are as critical as resolution, frame rate and light sensitivity. Setting up cameras inside and around a prototype cars and sleds, controlling the cameras by software and downloading the images can be time consuming task. A smooth, fast and reliable workflow saves time and allows the staff to focus on other issues. Up to now small high-speed cameras compromised resolution, speed, sensitivity or image quality. The new pco.dimax CS camera system combines all of these desirable characteristics in a com¬pact and ruggedized housing. It is flexible designed opti¬mized for onboard, sled and off-board applications meets demanding in-car and component crash test requirements. The camera delivers 1500 frames per second at Full HD+ resolution (1920×1440 pixels). Slow motion sequences with Full HD resolution (1920×1080 pixels) can be cap¬tured at more than 2000 fps. Often test setups result in compromised lighting situations with very bright and dark areas within a single image. This tends to conceal relevant information due to reflections and shadows. Thanks the pco.dimax CS having outstanding light sensitivity and high dynamic range it images perfectly in these demanding set¬tings providing highly detailed image resolution that would be otherwise hidden. In addition to high imaging performance PCO fo¬cused their attention on making the camera highly versa¬tile so the user can easily change mounting positions from off-board to onboard positions and vice versa. Facilities with a limited number of cameras who need to change their setups for different tests within a short period of time will benefit from the camera’s versatility and compact size while still complying with current NCAP film regulations for off-board and onboard positioning. Easy to change lens adapters allow the use of solid C-mounts for high-G applications and F- and EF-mount lenses for off-board applications. An electronic Canon lens adapter is a user-friendly feature for when the camera is placed in positions that are hard to access – such as film pits, ceilings or crash blocks. The operator can control focus and aperture settings via software from the control room ensuring fast and safe workflow. In terms of safety and reliability, high-speed camera users demand the cameras work under the harshest environ¬ments. High priority was given to designing in the reliability and safety of the camera under these conditions. A battery pack ensures that it will run independent from the power sup¬ply. Thus a power failure in the facility won’t stop the cam¬era from recording or keeping the images in the memory. The pco.dimax CS camera was designed with a pulse length filter to prevent strong electromagnetic inter¬ference (EMI) from causing false triggering. An integrated phase-locked loop (PLL) provides secure synchronization of each camera that has been connected to a sync source. If the synchronization signal drops out, the cameras keep running exactly at the previously supplied sync frequency. When the pco.dimax CS camera is used onboard the op¬erator can rely on the high g-trigger function to trigger the camera if the external trigger fails or if an external trigger signal is not provided. The incorporated acceleration sen¬sor detects high g-forces and triggers the camera at a user-defined threshold. 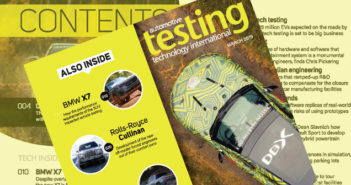 The g-force threshold can be set via software to meet the needs of each test requirement. Passive safety applications largely require specialized equipment. 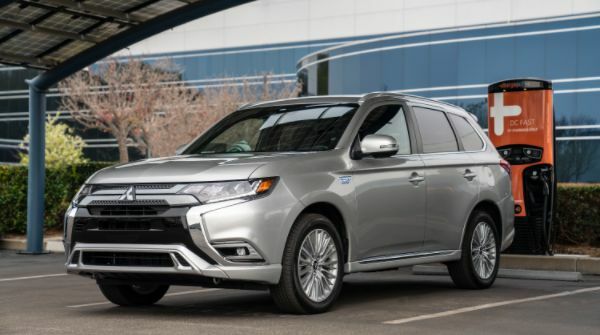 PCO offers purpose-made accessories to meet these demands. In high-g environments a rugge¬dized junction box with a battery back-up supplies power, Ethernet, trigger and sync signal for up to ten cameras. In order to protect the optical axis from strong side acceleration during impact an optional lens cage provides high stabilization for the camera lens mount and the lens. PCO’s new application-oriented software package is a critical part of a powerful system’s solution. The software helps facilitate the work flow while setting up cameras and downloading images by minimizing effort and time expenditure due to a well-structured, clearly arranged software interface and an unlimited number of reloadable camera settings. The software’s flexibility and reloadable settings promotes efficient changes of setting when alternating between tests. Crash and component testing are critical processes requiring high investments, therefore a reliable camera system tailored to the application’s requirement can greatly reduce future expenditures by optimizing work¬flow and keeping downtimes low.